Diving games add some fun and excitement to any pool party. Be sure to find out how well your little or big guests can swim and ALWAYS have adult supervision. Never allow diving in the shallow end of the pool. 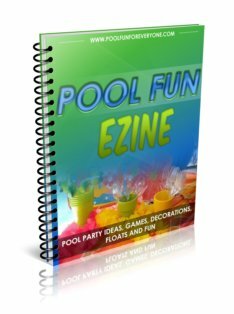 Dive games can be geared to the theme of your party. Dive for sunken treasure for pirate party games or find friendly seahorses for a mermaid game. One can find dive toys that appeal to almost any interest or character. This is a kids pool game that has been enjoyed by children from the ages of 4 years old to 8 at our pool. The netted fish, Bubba, sits at the bottom of the pool. Place him at a depth that is comfortable for the swimmer. The swimmer swims to the bottom of the pool and inserts an orange fish into Bubba's mouth. One at a time they feed fish into Bubba's mouth taking turns. When almost all of the fish have been "fed" to him, he rises to the top and floats on top of the pool. It is something different to play with in the pool and a way to motivate kids to go underwater. Who knew? 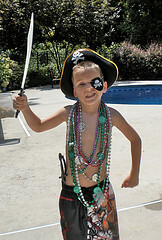 The favorite pool party game for our boys pirate pool party was diving for sunken treasures of colorful beaded necklaces. We just threw strands of dollar store plastic necklaces across the pool. One at a time they would see how many necklaces they could gather in one breath. Surprisingly the boys asked if they could take home their necklaces - why of course! They stay in place at the bottom of the pool ( in our case the shallow end) with attached weights. Place the hoops at a comfortable distance to swim through in one breath. At the last hoop place your treasures of real coins or beaded necklaces and jewelry. 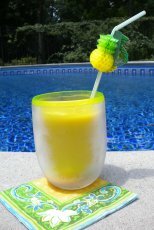 We use these dive eggs for almost all of our kids pool parties. A plastic pirate ring was placed in the eggs for our pirate pool party and a fun frog for the frog party. Butterfly rings were used for our butterfly themed party. Kids love diving for their "treasure" knowing that they can keep whatever is in their egg. Use real coins for a special surprise. Get a small net, and you may have one at home, but if not we bought this dive toy with a small fishing net. Then throw and scatter pennies, quarters, nickles throughout the bottom of the pool. Give each guest a certain amount of time (or what they can get in one breath) to gather up as many coins from the bottom of the pool. Let each guest keep their "treasure" to take home. Friendly seahorses are waiting to be found at the bottom of the pool. Have at least 12 little seahorses. As you can see there are 4 different colors. From a bowl with the colors written on pieces of paper, have each girl pick the color seahorse she is to find. Each girl is given one opportunity to pick up as many seahorses in her color in one breath. The girl who gets the most seahorses is the winner. Depending on how many kids are at the party, you could also put them into two teams. One team dives for the blue and yellow seahorses and the other team dives for the pink and green ones. The team with the most seahorses wins. Our niece who has been visiting us this summer loves this game and we play it almost everyday. Set the timer from anywhere from 15 seconds to 90 seconds. Throw the ball and try to get to it to deactivate it before the timer goes off. It has an LED light so that you can see the seconds that are left and there is a beeping signal as well that goes off when the button is pressed. You can also set the ball to float, sink or to just sink a little bit in the water. 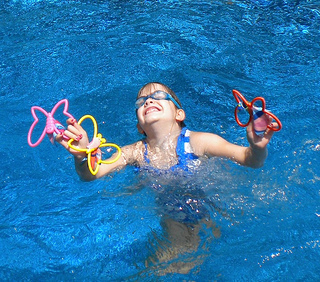 Make your diving games appealing to your child by selecting dive toys that match their interest and age - whether it is butterfly dive rings or pirate rings hidden in dive eggs.